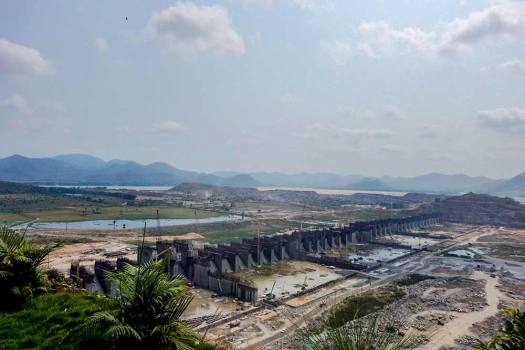 A view of Polavaram irrigation project, in Andhra Pradesh. 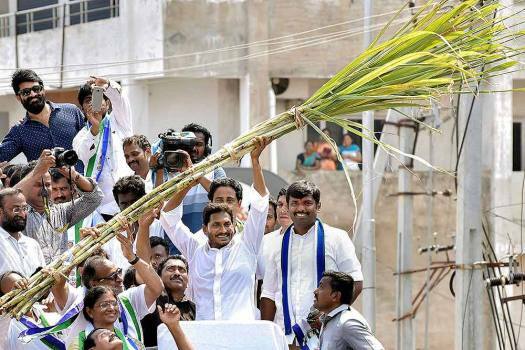 YSR Congress President YS Jagan Mohan Reddy greets his supporters at an election campan rally at Eluru in West Godavari district, Andhra Pradesh. 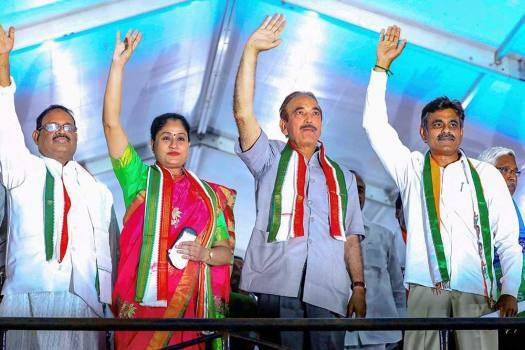 Congress leaders Ghulam Nabi Azad, RC Kuntia, Vijayashanti and Kodandaram at an election meeting in support of party candidate Konda Vishweshwar Reddy at Maneguda, Chevella. 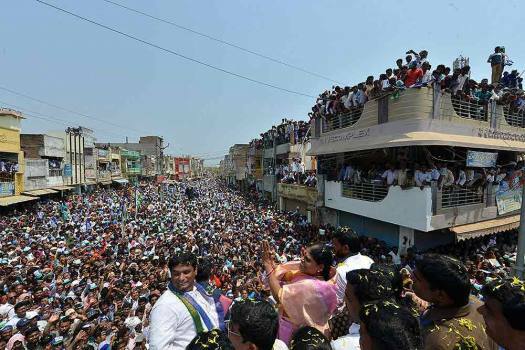 YSR Congress President Y S Jagan Mohan Reddy addresses an election campaign rally, ahead of the Lok Sabha elections at Anakapally in Vizag district. 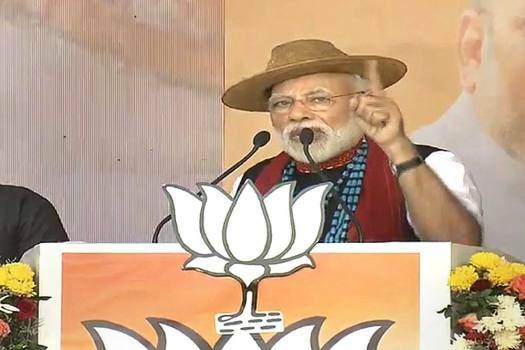 Prime Minister Narendra Modi addresses a public rally at Pasighat, in East Siang district. 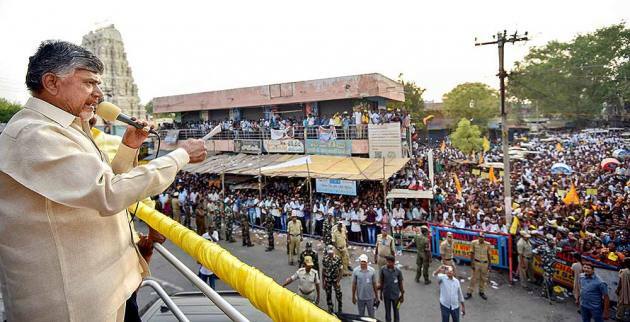 AP CM and Telugu Desam Party President N Chandrababu Naidu addresses an election campaign rally in Pulivendula, Kadapa. 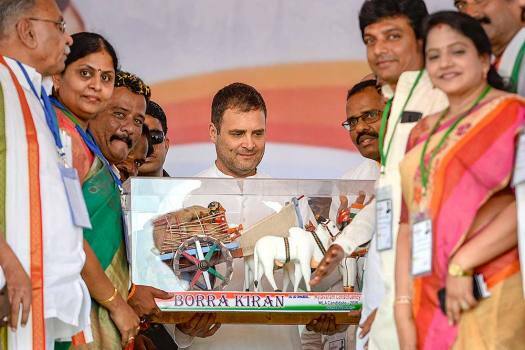 Congress President Rahul Gandhi being presented a memento at an election campaign rally in Vijayawada, Andhra Pradesh. 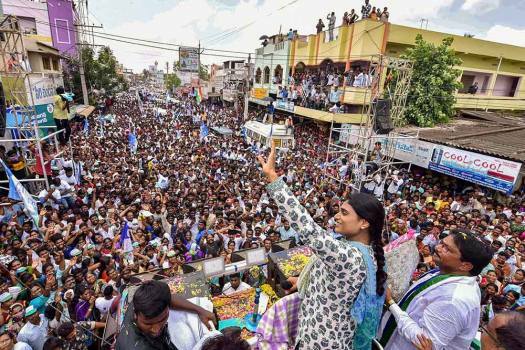 YSR Congress party leader YS Vijayamma addresses a public rally, ahead of the Lok Sabha elections at Srikakulam. 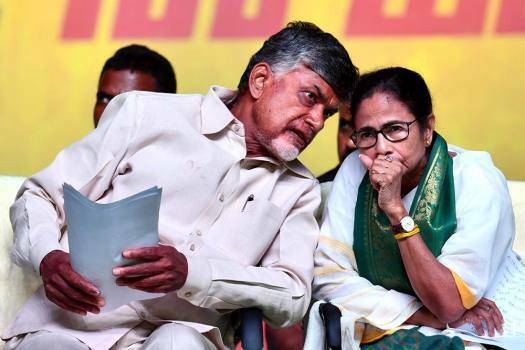 Andhra Pradesh Chief Minister Chandrababu Naidu talks with her West Bengal counterpart Mamata Benerjee during poll campaign in Visakhapatnam. 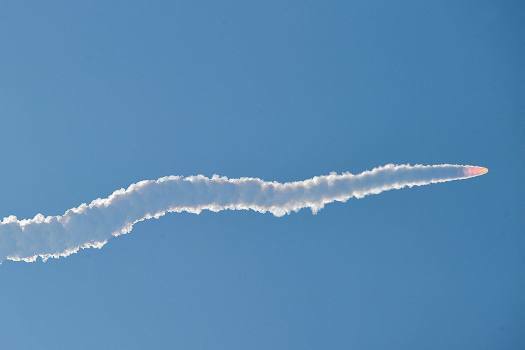 Indian Space Research Organisation (ISRO)’s PSLV-C45 carrying EMISAT and 28 other satellites lifts off from the Satish Dhawan Space Center in Sriharikota. 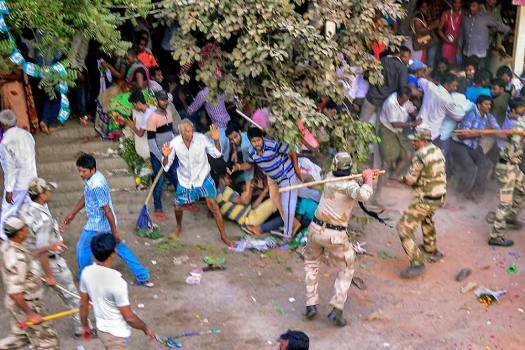 2 were killed in Anantapur district of Andhra Pradesh and more than 10 others were injured as clashes between TDP and YSRCP at various places marked the polling on Thursday. 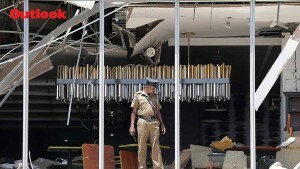 Jana Sena MLA candidate Madhusudhan Gupta on Thursday smashed an Electronic Voting Machine (EVM) at a polling booth in Gooty, in Anantapur district of Andhra Pradesh where Lok Sabha, Assembly polling began at 7 am. 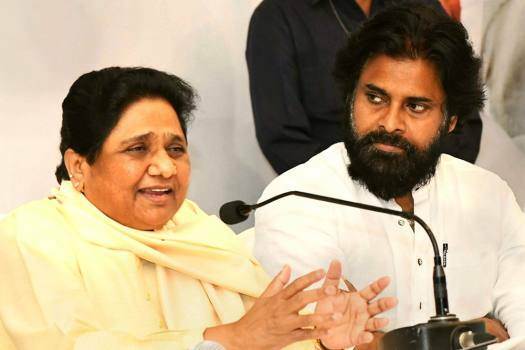 As voting for 175 Assembly and 25 Lok Sabha members in Andhra Pradesh began at 7 am on Thursday, the electronic voting machines (EVMs) had glitches resulting in some delay in polling. The voting for the first phase of Lok Sabha elections 2019 ended at 5pm on Thursday. 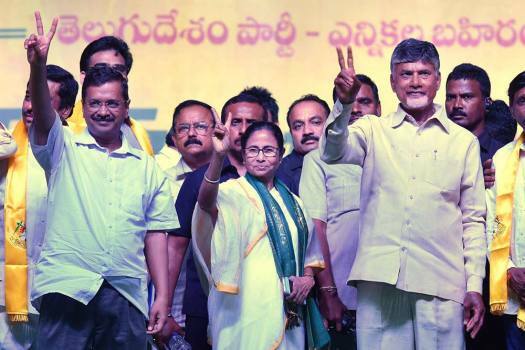 The ruling Telugu Desam Party in Andhra Pradesh on Saturday released its manifesto for the upcoming Lok Sabha elections promising doles to the tune of Rs 2 lakh to each family every year, with the monetary benefits starting from womb to tomb. 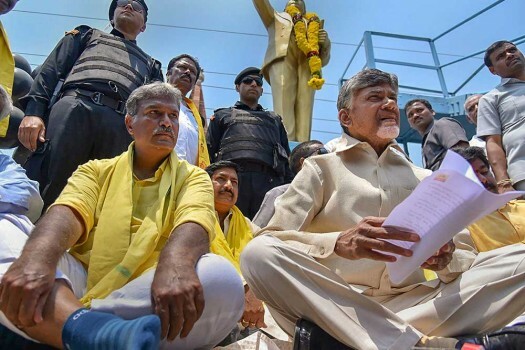 Naidu said the Election Commission failed to act on the complaints against YSRCP that they misused Form 7 to delete seven lakh votes. 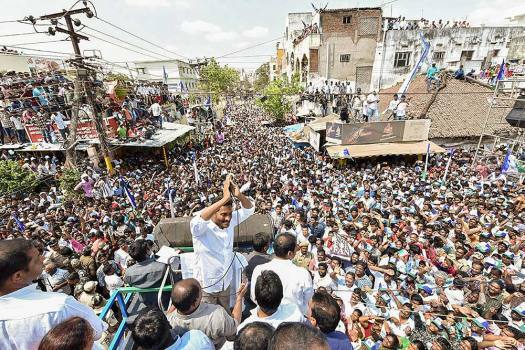 The Universal Health Card scheme will be personally monitored by Jagan Reddy. 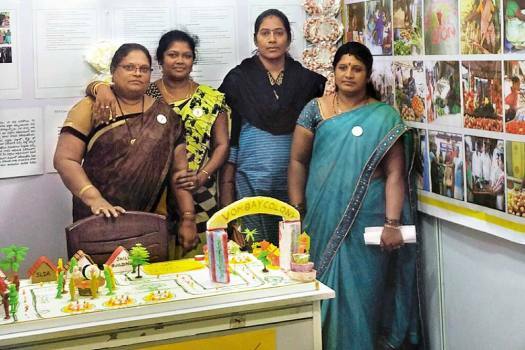 The Andhra Pradesh Chief Minister N. Chandrababu Naidu puts his trust in his understated ministers. 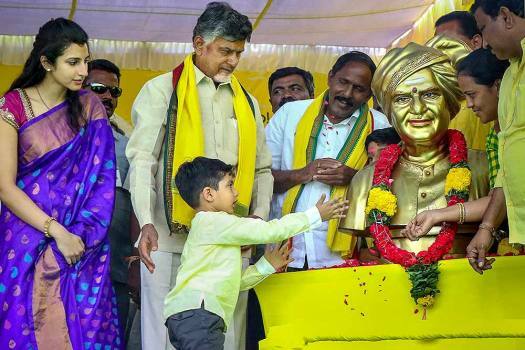 A ‘murder’ allegation is likely to have some impact on N. Chandrababu Naidu’s personal image as well the TDP’s poll prospects—at least in volatile Rayalaseema. The BJP’s prospects in Telangana and Andhra Pradesh (which will also elect its assembly alongside the general elections) look dim. Is the saffron party neglecting the smaller parties? Analysts say allies are alienated by the way the BJP functions. 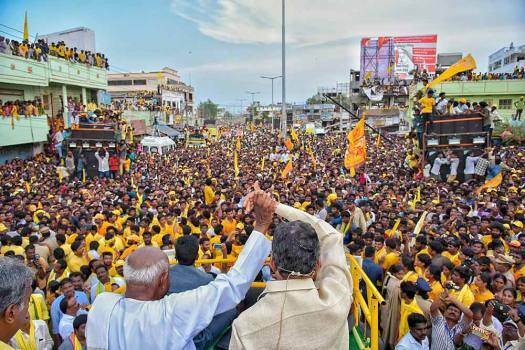 In an interview with Outlook, N. Chandrababu Naidu talks about his political goals and how he plans to go about them. Slowly and cynically our politicians have started laying the groundwork for the next communal buildup. First, we had the Sachar report, which has now become the basis for the Muslim community’s claim to victimhood. Next, we have had state governments using quotas to woo the Muslim voter. On the same day on which the Andhra Pradesh high court struck down the state government’s orders on Muslim quotas, the West Bengal government rushed in to announce 10 per cent job reservations. Nobody is saying that Muslims don’t need jobs, education and other support systems to develop. But what is the need to help them as Muslims? When below-poverty-line (BPL) families can be helped without communal identification and NREGA benefits can be given on socio-economic grounds, Muslims can be helped the same way. He makes a very clear point. Apart from the constitutional issues, even in terms of implementation, it would be far more preferable to revisit the whole quotas and reservations debate. It is time to do away with all caste based quotas as well, instead of coming up with religious based ones. Building consensus for affirmative action -- which need not just be quotas or reservations -- only on measurable indices such as income, education level of families etc would be far easier and effective. 91. Turning to the present case, there is no material placed before this court by the State Government to prove the valid classification which has got nexus with its policy and object to be achieved. The material is not sufficient to show that such a classification is based on intelligible differentia and the basis has rational nexus with the policy and object to be achieved under the statute. In view of the above, the impugned Act has to be struck down as violative of Art.14 of the Constitution being irrational and illegal. 92. Further, the standards applied to the data by the Commission are equally applicable when the Government determines to provide benefit of such an inquiry. The State should produce material before the Court to show that there was a proper inquiry and relevant criteria adopted and the decision is reasonable, but mere expression is not sufficient. In the absence of any data with regard to social backwardness or educational backwardness, the action of the State Government in providing reservation to socially, educationally backward classes among Muslims have to be struck down as the data lacks the criteria of the material for determining social backwardness and criteria for educational backwardness. The Commission has utterly failed to have a statewide social and economic survey combined with educational survey and also failed in conducting test of income and occupation for selecting the individuals who compose a backward class. In the absence of criteria basing on the inaccurate data, it can be said that the Commission has not formulated any standards for the application of income or occupation tests and also in respect of the educational backwardness. Further there is no correct data furnished either by the State Government or by the B.C Commission that whether in the opinion of the Government, the present identified classes of Muslims are inadequately represented in the services of the State. Even in the counter filed on behalf of State Government with reference to the state average in determining the educational backwardness, it did not disclose the group wise percentage of literacy. On the basis of meager data collected by the Commission for the assessment of educational/employment backwardness, it can be said that the data is unsatisfactory. It is un-understandable as to how the Commission could prepare a report within two days and it shows that the Commission has acted in haste and without proper application of mind. As the B.C Commission has acted in a hasty manner and without any scientific survey, I am of the opinion that the data collected is not sufficient for the Government to come to the conclusion that specific classes of Muslims can be classified as ‘backward class’ for the purpose of Articles 15(5) and 16(4) of the Constitution of India. The Commission has not proceeded on correct lines to assess the social and educational backwardness as indicated in other cases or has followed any criteria for such assessment. In the absence of any such material, it has to be held that the State Government has utterly failed to discharge its onus of proof to establish that the reservations are for socially and educationally backward classes of citizens and that the enactment is based on sufficient material to support the classification. If the court perceives that the identified classes exist, then the Court will uphold such law for the purpose of doing social justice, but in the instant case the exercise of identifying specific group of backward classes is not rational; therefore the Court cannot uphold the law made by the State. The same has to be struck down for want of sufficient material or appropriate data. (4) the report should be held to be mechanical, perfunctory in nature and is without application of mind as the Commission followed the report of Mr P.S. Krishnan in verbatim. A relentless crusader for human rights for three decades now, Andhra Pradesh HC lawyer Balagopal has fought cases from extra-judicial killings of political dissenters to atrocities against Dalits and women. And he has often suffered personal attacks for his efforts, by the police and others shamed by his exposes. But he has never faltered. His reports on encounter killings, backed by painstaking investigative work, had such credibility that even the state could not ignore it. He doesn’t take legal fees from poor clients. 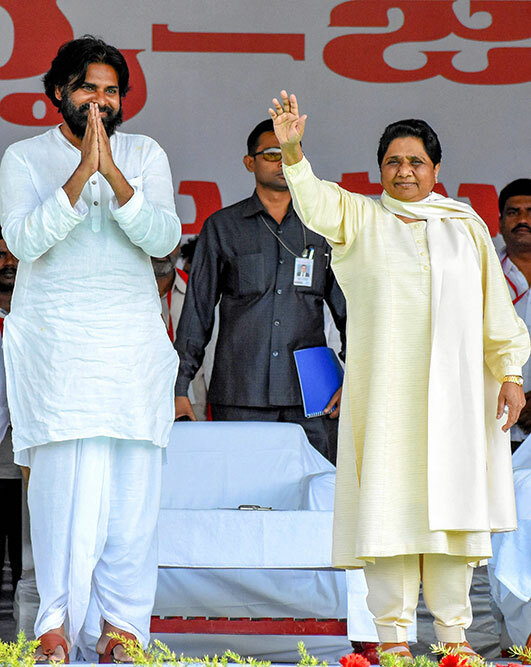 And he travels endlessly across rural India, giving a voice to the opinions and problems of the poor—from farmers and tribals being displaced by SEZs in Nandigram or Visakhapatnam, to beedi workers seeking minimum wages, to tribals trying to protect their homes and forests. One of the most respected civil liberties activists in the country, Balagopal has inspired an entire generation to engage with the causes he espouses. A sense of irony is the only way for me to describe how I felt when I heard about Balagopal’s death. Ordinary people leading ordinary lives die of heart attacks. And despite the simplicity with which he led his life and interacted with people, every time one met Balagopal or heard him you always knew you were in the presence of someone extraordinary. Whenever he left after any meeting, Balagopal left you a little scared about whether you would ever see him again. 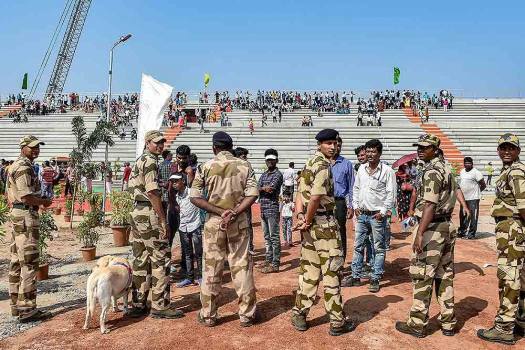 As a result of the position that he took- against the violence of the state as well as the violence of the Maoists, you were always left with the lurching fear that any point of time, you would be given the news that Balagopal had been killed in an encounter. At the same time it is perhaps not surprising that despite living a life which was scripted towards a violent death, it was only appropriate that his death transcended any partisan act of violence...If Balagopal was a regular anti violent activist or a pacifist, then there would have been nothing surprising about his stance on violence, and to argue for the importance of non violence would hardly be an act of courage. But for someone who had spent a better part of his life in struggles, and in battles against the impunity of the state, the commitment to an ethical position on violence becomes a deeply ethical choice of bravery.